Please visit the Legislation and Votes webpage at the Clerk of the House website. The following webpage will display. Legislation & Votes page of the House Clerk's website. Under a Legislation Information heading are subheadings (and related information) for Bill Summary and Status, Bill Text, and Public Laws. The next major heading is 'Roll Call Votes' followed by and explanation and then links to the roll call votes of the current Congress and then a link to previous congresses. Under the Roll Call Votes heading, choose the link of the appropriate Congress and Session to view roll call votes for that session. 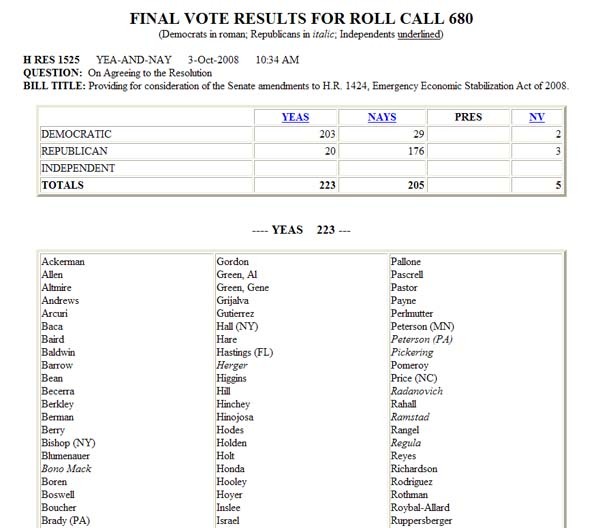 You also have the option of viewing roll call votes from past sessions of Congress. Once you have selected the Congress and Session you want, the following webpage will display. 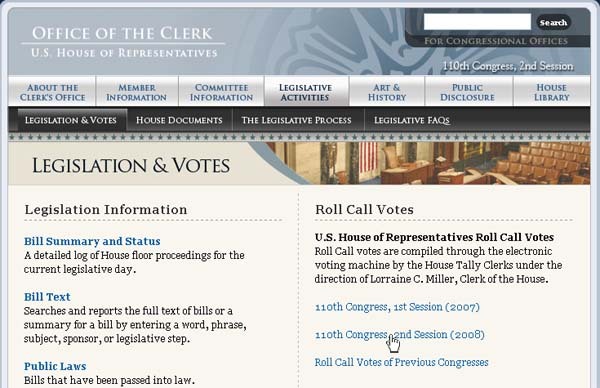 The U.S. House of Representative Roll Call Votes page from the House Clerk's website. Features a six column table. The first column (Roll) has the roll call vote number. The second column (Date) has the date of the vote. 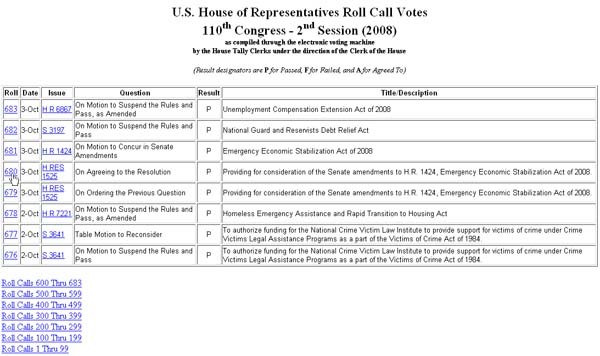 The third column (Issue) has the bill number that the vote related to. The fourth column (Question) has the specific motion being voted on. The fifth column (Result) indicates if the vote passed (P), was agreed to (A), or failed (F). The sixth column (Title/Description) gives the title of the bill being considered. The following webpage will display. This is the Final Vote Results for Roll Call 680 page from the House Clerk's website. After indicating the bill number, the type of vote (in this case 'Yea-and-Nay'), the date and time of the vote, the motion, and the title of the bill that the vote relates to, there is a five column, five row table. The first column has the political parties. The second column (Yeas) has the number of yes votes. The third column (Nays) has the number of no votes. The fourth column (Pres.) has the number of Members who voted 'present' and did not vote yes or no. The fifth column (NV) has the number of Members of the House who did not vote. The first row has the column headings. The second row has the votes by Democrats. The third row has the votes by Republicans. The fourth row has the votes by Independents. The fifth row has the total votes. After the table is a list of the Members of the House who voted 'Yea'.